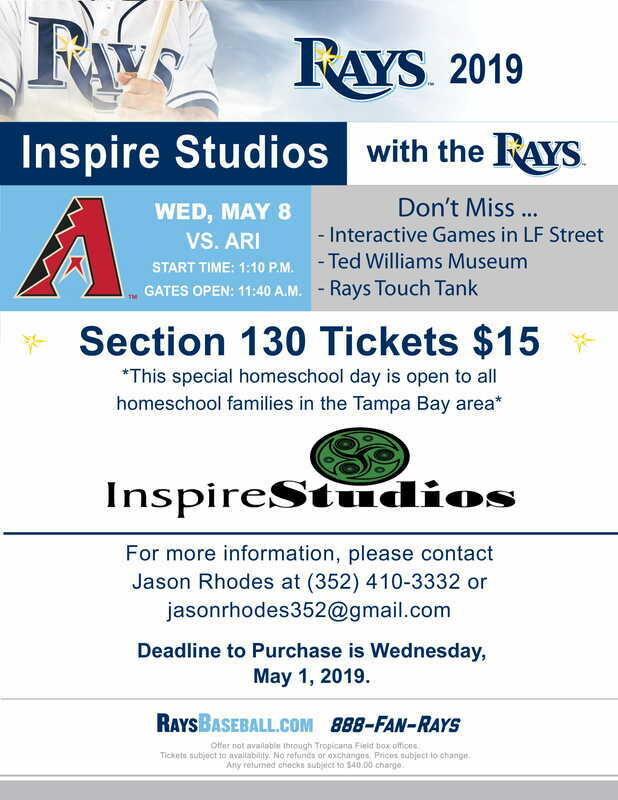 ​Join Inspire Studios and your Tampa Bay Rays on this inaugural homeschool day game. This is for all homeschool families in the Tampa Bay area. Tickets are only $15 per person when pre purchased on the link below. Parking is NOT included in the ticket price. Gates open at 11:40 am and the game starts at 1:10 pm. Tropicana Field is cash-free. Purchases, including concessions and parking can be made on all major credit cards, Rays gift cards, and NFC mobile payments. Don't miss: Interactive games in LF Street, Ted Williams Museum, Ray's Touch Tank, and much more! Email inspirestudiosfl@gmail.com if you have any questions.